Inspired by the time boxing system, this hourglass is a beautifully designed way to track your productivity. How much easier would the work day be if you knew you only had to be productive for 25 minutes at a time? Inspired by the time boxing system, a simple project management tool that allows a fixed time for each task, this hourglass is a beautifully designed way to track your productivity. Simply turn the glass when you're ready to begin filing reports, typing a statement, or even cleaning the kitchen, and the hourglass's soothing metal "sands" serve as a quiet reminder that you're right on track. The gray grains make a relaxing whirring sound as they pool to the bottom of the glass, creating white noise to calm distractions. Once you're done, take a breather before moving on to the next task on your list. Made in China. I started using the Pomodoro technique where you focus on a task or project for 25 minutes and then take a 5 minute break. 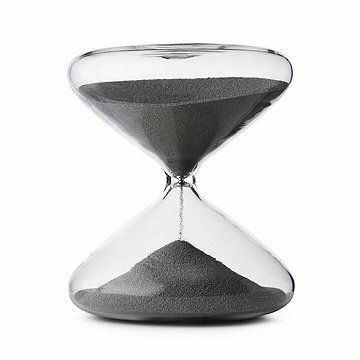 When I saw this hourglass I thought it would be a unique way to implement the technique rather than using a digital timer or stop watch. I timed the hourglass 3 different times and it came out at just under 26 minutes. I know I am being petty but I am an engineer and I appreciate preciseness. That really is my only gripe otherwise it is an amazing product. She's an artist and had been setting the timer on the stove for 30 minutes. This is way better and worth it. Good looking and well made. Everyone just wants to watch it, including me. I use it to time how long I sit at the desk. When it runs through it is time to get up and walk around for a bit before sitting down again. Advertising it for use in connection with some esoteric productivity program no one ever heard of is really stupid, unduly limiting. Great item, I love it. finally a good hour glass. This is a great gift. sturdy, and classy. I would order it again and recommend it. I use the timer for pomodoro sprints (25 minutes of focused work on one task). I got tired of running them on the computer or phone since it was distracting and this is a perfect replacement. No loud alarms and simple to use - just flip it. Bonus Tip - I use a small magnet to pause the timer. Placing it near the neck completely stops the flow of the metal "sand". It's also fun to play with the magnet and make shapes inside the glass. The sand stops flowing at random times so to use it requires watching it continuously. If I had not thrown out the packing it would be going back. So beautiful I didn't give it away but decid d to keep it myself. Love the modern style, the flat base and leather coaster. Just wish I could get one for an hour too! This was a fantastic gift for my uncle who owns his own business and appreciates unique and fun designs. He seemed to really love it. It looks great, works great, and if nothing else, will be a great conversation starter.